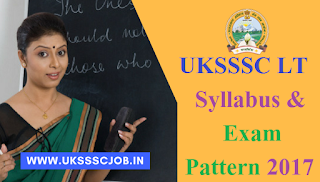 Uttarakhand Subordinate Service Selection Commission (UKSSSC) is going to filled 1767 LT vacancy under UKSSSC LT teacher recruitment notification 2019. According to UKSSSC officials Expected Dates for the conduct of UKSSSC LT Teacher Exam is in October 2017. Candidates who are appearing in UK LT exam 2019 can check here exam dates, previous year papers, Syllabus and exam pattern for the exam.